Now that we've all had a couple of weeks after the AAGs to relax and make fun of certain unnamed party-animals, we thought we would reflect on how the conference itself was reflected in the Twittersphere. With comments abound that there was more conference-related Twitter activity than ever before, we wanted to see if we couldn't uncover some more specific trends. 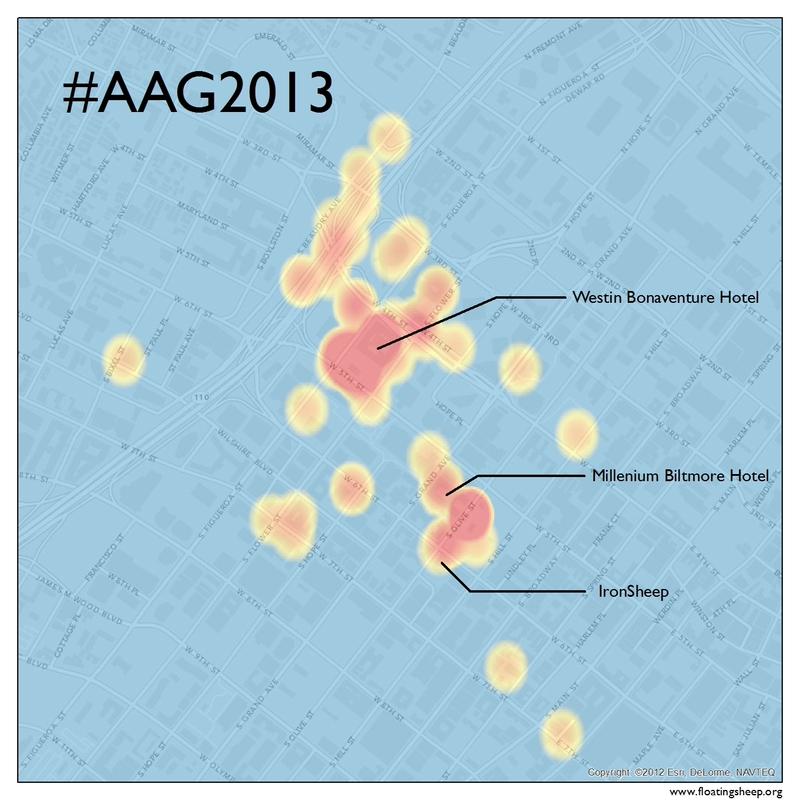 Thanks to an enterprising geographer, we have an archive of all 3,154 tweets with the official conference hashtag, #AAG2013. We know from this database that those tweets came from a total of 697 users, of which the top 10 users contributed about 23% of the total number of tweets. But cross-referencing the Eventifier database with DOLLY's archive of geotagged tweets with the conference hashtag, we can try to understand how and where some geographers tweet and whether geographers fit the overall profile of Twitter users in terms of geotagging. Do geographers geotag their tweets at a higher rate than the average user because of their heightened awareness of spatial issues? Or do they intentionally avoid geotagging their tweets due to sensitivity to location privacy? According to DOLLY, there were just 137 geotagged tweets with #AAG2013, coming from just 41 users. So, rather than adhering to the oft-cited rule of ~1.5% of all tweets being geotagged, geographers in Los Angeles for the AAGs actually geotagged more than 4% of their conference-related tweets. Of the 137, 127 actually have exact lat/lon coordinates, so we're able to do some mapping at the urban scale in order to see where geographers were tweeting about the conference. And because only 8 tweets came before the AAG started on April 9, and only 5 came after it ended on April 13, and these are roughly congruent with the 16 tweets outside of Los Angeles County, we'll focus on the 113 of 127 tweets with exact coordinates which were located in downtown LA. In other words, because most of the AAG-related tweeting happened during the conference and in its general proximity, it isn't too interesting to focus on the other locations from which the hashtag was being used. As is evident from this map, the vast majority of the tweets referencing #AAG2013 came from the Westin Bonaventure Hotel, the primary site of the conference. The second highest concentration of tweeting activity came from the Millenium Biltmore Hotel and LARTA, the secondary conference site and location of our IronSheep event, respectively, which were just half-a-block or so apart, and immediately adjacent to Pershing Square. But given the lack of free conference Wi-Fi and general lack of cell phone service in the Biltmore, it's even less surprising that it had quite a bit less geotagged tweeting activity. Other small pockets of tweeting activity around the downtown seem to be located in the general vicinity of bars that were known to be frequented by geographers, such as the Library Bar, which hosted multiple conference related parties over the course of the week. As is the case with many of our maps, there's nothing too surprising here. Of course it makes sense that people tweet about the conference from the location of the conference. But we'd still be careful about reading too much into these results. More specifically, we shouldn't get the impression that geographers go to the AAGs primarily to sit in stuffy hotel rooms giving paper presentations rather than gallivant around town with old friends, instead, it seems more plausible that geographers are simply having too great of a time at various drinking establishments to tweet about it, or too smart to use the official conference hashtag when doing so! The hipster murder hostel, with it's surprising popularity amongst the geoweb set, appears to have made it onto the map. Hello - I came to your site by way of the Hate Map project, which, as a map geek (but not a geographer), I think is really awesome. My question is about live tweeting conferences. Do you have any thoughts on the benefits of getting attendees to do live tweeting? For one, it seems to add publicity to an event, albeit within the social circles of those who are tweeting. What do you think it added to the AAG conference in particular? Did it make people feel more connected or in-the-know? Did people use the hashtag to see what others were talking about or to network? I'm interested in that sort of anecdotal information if you have any. I ask because I notice that conferences are increasingly being live tweeted, and because I recently attended a conference for which few people were doing so. My guess is that many of the attendees likely do not use Twitter (skews to a slightly older demographic) and there was also no official hashtag that was publicized. The handful of people who decided to live tweet (including myself) just made up their own tags, but used a few variations (e.g., #SfAA2013, #SfAA13, #SfAA, etc. ), so there wasn't much consistency. I've been talking to the IT committee of our organization (The Society for Applied Anthropology) about having a more active Twitter presence and coming up with a hashtag for our next meeting, but am trying to find out what other conference-goers think about it. I think this wasn't necessarily live tweeting, but just general tweets about things at the conference. My tweets, for example, were just random things I noticed or stuff like "where's the party at?" Personally live tweeting drives me bonkers, or at least when people just tweet random quotes from presenters. Much more interesting to me are things about cool stuff people saw, i.e. "Really cool presentation on a new tool that does XYZ" rather than some quote: "'Data is important'--Joe Blow"